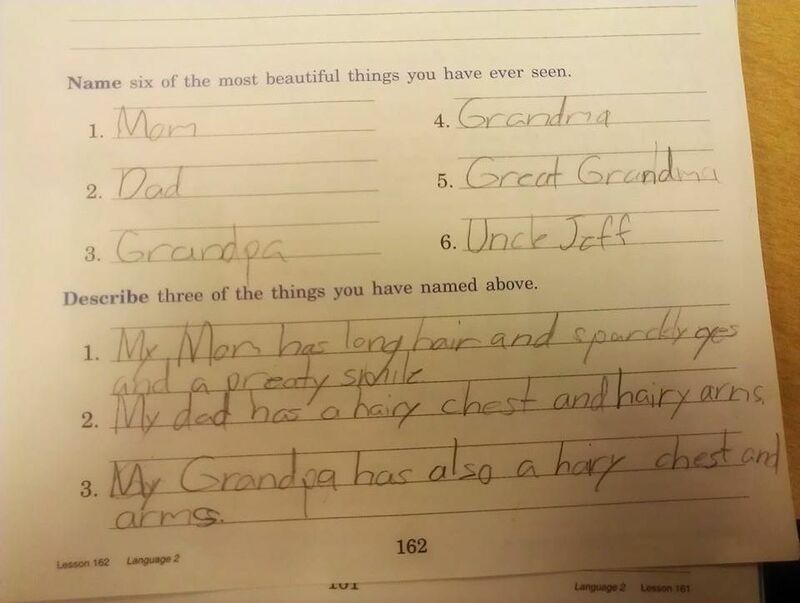 It’s probably safe to assume that Uncle Jeff has a hairy chest and arms, as well. Thanks to Jessica for sharing her 7-year-old’s astute, concise observations detailing the only real meaningful difference between males and females. And have a terrific Father’s Day, all you hairy beasts out there! Just don’t go shedding all over everybody! Posted on June 13, 2014, in For Dads, For Moms, Miscellaneous, School Assignments, Views of Adults and tagged children writing, Father's Day, funny, funny writing, Humor, kid writing, Kids, kids views of adults, school writing assignments, Stuff Kids Write. Bookmark the permalink. 9 Comments. awww adorable not to mention funny! I think that it’s cute how this child named their family members as the most beautiful things that they have seen. Awesome! And good to see that body hair is not an impediment to beauty ha ha!